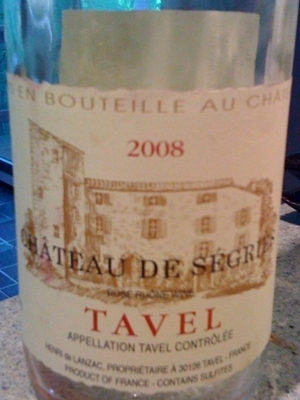 We enjoyed the 2008 Chateau de Segries Tavel Rosé last night with some tacos and was a nice pairing, although this Rosé could go with just about everything. A fabulous Rosé , and a great value. If you love dry Rosé and want to try a great example give this one a whirl! Riding the Rhone train, Organically! Finding a really good Rhone wine for $15 dollars or under can be a hard enough challenge, but finding one that is $15 and organic would seem near impossible. Not that I went looking for a wine that fulfilled these two requirements, but it did peak my interest when I saw an organic Cotes du Rhone at a Barrel Thief tasting back in June. We decided to pull out the 2006 Perrin & Fils Cote du Rhone “Nature” with some of our Tofu Parmesan the other night. The fully organic Ecocert certified grapes come from a single vineyard located in the commune of Tulette. Soil on this site consists of a chalky clay consistency and lies at an elevation of 144 meters. The 2006 “Nature” is a blend of primarily Grenache (95%) and Syrah (5%). This was a great wine, and a great value, and a bonus for this tree huggin’ environmentalist that it was produced organically. Not that I think it tasted better because it was organic, but I just appreciated that it was. This was the 7 layer cake of wines, dark fruit, good earthy “stinkiness”, herbs, and vegetables and even the unusual marshmallow note. Not a bad deal for fifteen bucks. This is very well distributed so you should be able to find it in your local wine shop.